On Tuesday we took a trip to Manchester for the North West's biggest fashion week. Based at Avenue North in Spinningfields, Missguided (the main sponsor of the show) put on 5 shows throughout the day styled independently by blogger Sara. She did an amazing job, all the outfits were eyecatching with a touch of her individuality. All her style picks were teamed with huge towering platform shoes which really stood out - I don't think we noticed any flat shoes at all! She deserves a pat on the back for choosing such memorable outfits and organising the entire show. Well done Sara! The first show we went to - "Nautical Fashion" combined stripes mixed with blue hues and bright coloured shoes. Colour Pop show combined light pastels with bright neons. On the last show of the day I was sat behind someone I instantly recognised - Rosie of Rosie-Glow! We had sent her clothing a couple of weeks ago and she kindly blogged about us - she has done an amazing job styling her picks...check her out! Striped leggings - another key look. My favourite show of the day was "Festival Grunge". 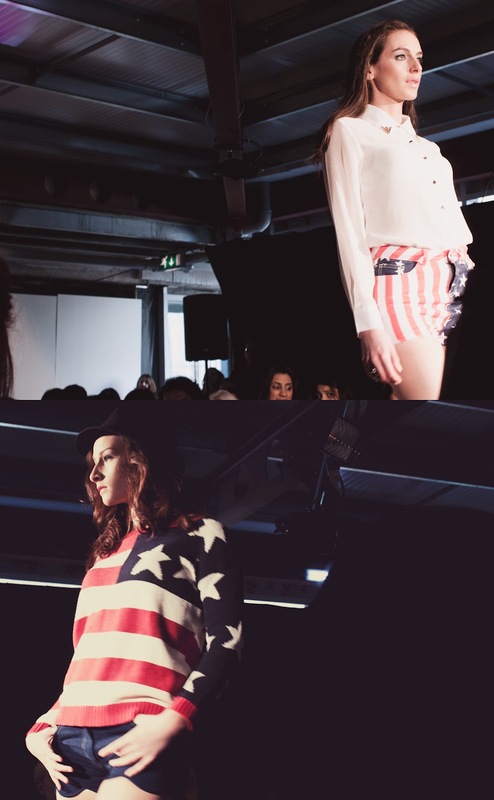 Lots of denim hotpants, button up blouses and american flags - the epitome of festival chic!